"Best Practices to run complex sourcing events"
Running complex sourcing events takes time and effort, but if done right, the benefits make it worthwhile. But Sourcing solutions are rarely used to their full potential. Most of the sourcing systems come with advanced functionality that can be used to run many types of events, and as these systems get upgraded, further functionalities get added. What constitutes a complex sourcing event? Why should you consider increasing the complexity of your events? 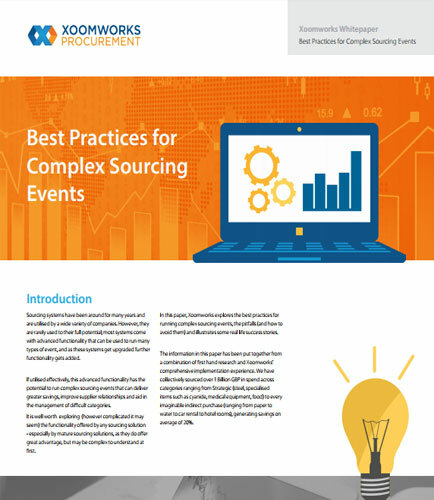 What are the common pitfalls in running complex sourcing events and how to avoid them? What are the most commonly used methods to overcome complex sourcing events? How to run events effectively and efficiently using the functionality offered by mature sourcing solution? What are the reasons behind potentially challenging complex sourcing events ? How to use valuable information collected with event responses to improve future events? It also includes ''Real Life Examples of Complex Sourcing Events''.